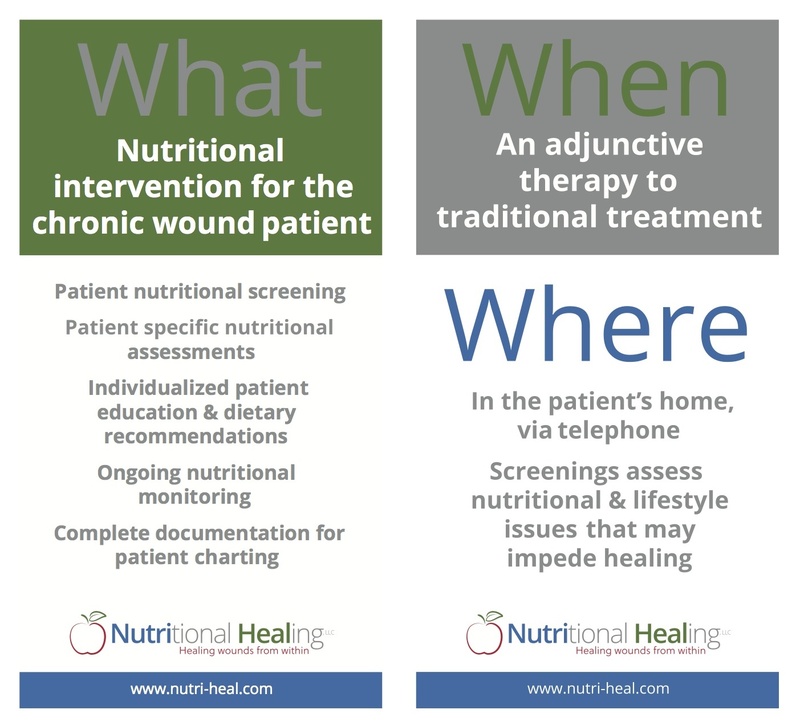 Nutritional screening via telephone by a Registered Dietician or sometimes meeting patients at the wound care center appointment. 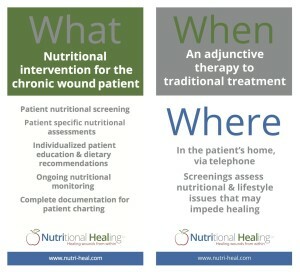 Nutritional education with the patient and/or caregiver. Assessment and calorie count of a three day food record. Analysis of labs to include CMP and pre-albumin. Diet guidance and nutritional supplements. Management, clinical support, and continuous monitoring of patient outcomes. Assistance with Physician orders and documentation. 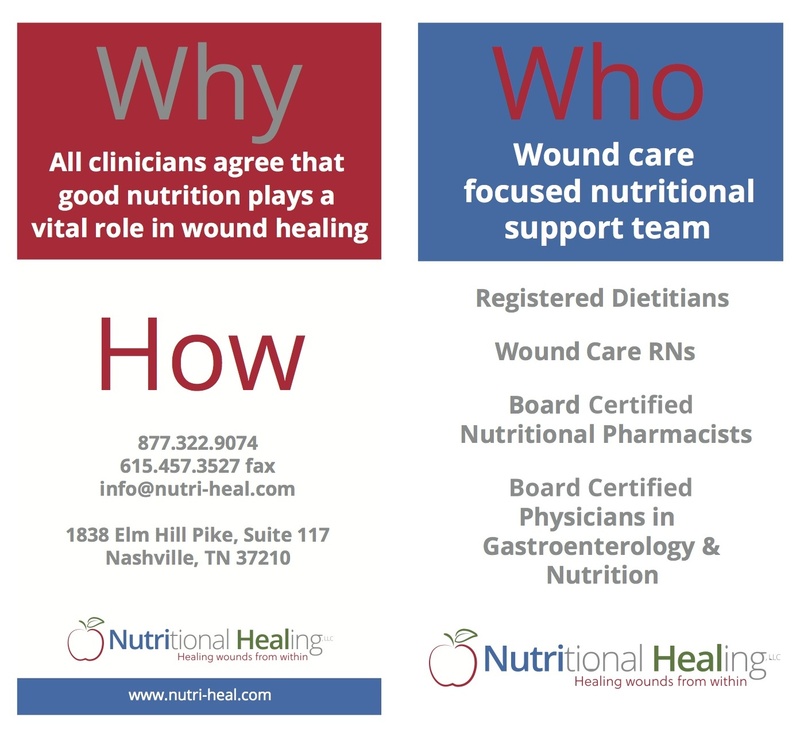 At Nutritional Healing, our number one priority is for patients and caregivers to get the nutritional support, education and assistance they need to provide the greatest chance for slow and non-healing wounds to finally heal! 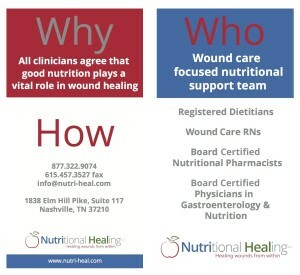 We have a hands on, dedicate team working with wound care providers to deliver the highest level of service to patients. Our program helps insure a well-educated patient and medical team that harness early intervention to create a long-term relationship with their patients. Nutritional Healing further enhances the care plan already in place by providers in order to produce even greater would healing outcomes. Best part, insurance may cover the program! To get started simply fill out our FREE initial screening and we will get back to you shortly for a follow up. We look forward to hearing from you. Stay Healthy!